I attended the Microsoft Worldwide Partner Conference in 2011 and 2012. Even 3-4 years ago we were hearing about the changing focus at Microsoft. While 2000-2008 was all about winning the platform war (.NET vs Java), 2008 had ushered in the cloud era in the Microsoft world. While Azure's platform as a service seemed front and center, WPC started beating the Office 365 drums. The message from Microsoft was starting to take shape – partners needed to get on board with where Microsoft was going with Azure and Office 365. Those that did would keep the attention and support of Microsoft. In a discussion with a Microsoft Canada Tele-Managed Partner Manager within the last year, I heard this message refined and pointed – Yes there were sales support dollars available but only for initiatives/opportunities where there was a clear cloud component. Have a large custom .NET app dev opportunity that would be deployed on premise to the client's infrastructure? Great, good luck, but not the marching orders Redmond gave its sales teams. This year, if there was any doubt where Microsoft has moved its focus, this tweet should put those doubts to rest. 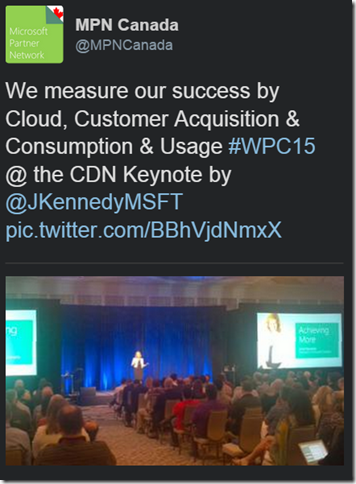 "@MPNCanada We measure our success by Cloud, Customer Acquisition & Consumption, and Usage"
That tweet seemed to be attributed to Janet Kennedy, President of Microsoft Canada. It lays out clearly how Microsoft Canada is measured, and by extension how the Partner community is measured. Getting customers to purchase cloud services (either a-la carte or through an enterprise license agreement (ELA). Consumption is different than usage though, which we'll cover next. Consumption is getting a client to agree to move some servers to Azure, or purchase 100 licenses of Office 365. Consumption gets the Microsoft products in production at the client. Over the years I heard of many large enterprise-size organizations who had an ELA which provided all sorts of licenses. Incredibly some products that the ELA provided valid licenses for were never deployed; they were never consumed. You can't get usage traction unless a customer actually uses (consumes) the product. Usage is the recurring revenue generated by using metered cloud services. This is the part where the meter runs and Microsoft (and the Partners) make money. Remember the example client we talked about who moved some servers to Azure? Maybe they realized some great cost savings over maintaining physical servers. Maybe they decide to move MORE servers to Azure, and more applications/processes to those servers, requiring bigger Azure VM instances. This is how consumption can lead to higher usage. Back in 2011 and 2012, the message was less frank and more suggestive. "Hey, we're moving in this direction. You should _really _listen to what we're saying. Things are going to be changing." Now in 2015, the message is loud and clear. "The cloud train has already left the station. A lot of partners are already on board, but if you run you can catch up and get on too. But we aren't slowing down for stragglers." And this isn't a bad thing, or a mean thing, or anything out of malice. Microsoft had to change their business to evolve, and having a partner program they rely on to move their product through means those partners need to be open to changing their focus as Microsoft does. Microsoft sets the vision for their partners, not the other way around. Those partners that were part of the program from 2000 to 2010 and built their business on custom app dev and on-premise IT services have a choice to make – adapt to the new world of Microsoft, or figure out how to live in a world without Microsoft's support.